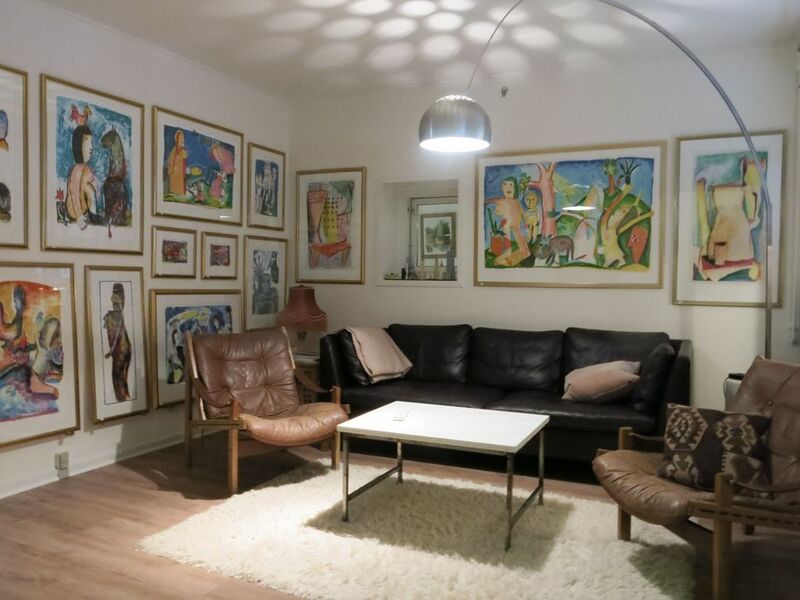 Close to shopping, cafés, restaurants and the Frederiksberg Metro station. Frederiksberg is known as the green heart of Copenhagen and is one of the city’s most popular neighborhoods. The area is safe, charming and excellent for families and at the same time you are very close to the downtown area. Frederiksberg shares borders with the very trendy neighborhoods Vesterbro and Nørrebro, where you will find an abundance of bars and restaurants. In short, this location is perfect if you want to live in a nice and quiet area close to downtown and Copenhagen and its immediate surroundings. A 10 minute walk will bring you to the shopping streets Gammel Kongevej, Værnedamsvej, Frederiksberg Allé and Vesterbrogade, green areas such as Landbohøjskolens Have, Frederiksberg Park, the Lakes and attractions such as Tivoli and the Planetarium. A fine apartment on the ground floor with direct access to a yard. The apartment is also used as a gallery and there are many pictures on the walls. Space for 4 persons in 2 bedrooms. 1 bedroom with double bed and 1 bedroom with single beds. Kitchen with dining table, living room, combined toilet / bathroom with shower. WiFi, TV with channels and capable of streaming with Apple TV, dishwasher. There are no laundry facilities but there is a coin operated laundromat 50 m from the apartment.